FU has almost 36,000 students; UCL has about the same number. FU uses Primo as a library discovery tool; UCL also uses Primo. 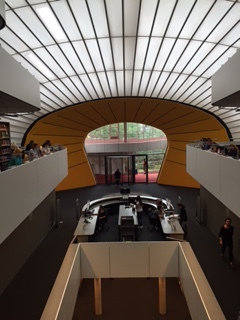 FU has 13 libraries in Berlin; UCL has 18 libraries in London. FU has over 300 librarians; UCL has over 300 librarians as well. FU used the library system, Aleph, and has moved to Alma; UCL uses Aleph and is planning to move to Alma. In fact, there are more similarities among the 19 librarian delegates from 13 countries than there are differences. We all strive to organise, preserve and share resources for research within a variety of structures and cultures. 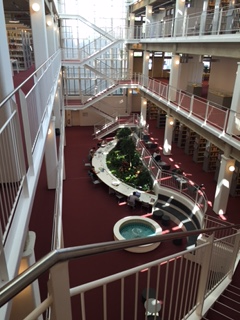 Perhaps at UCL, we don’t have the garden oasis that can be found in FU’s Campus Library (below) or the enticing curves of FU’s Foster designed Philological Library (bottom), yet UCL libraries do have their unique buildings, both old and new, and like FU, a wealth of resources. Libraries come in all shapes and sizes and while the outside space can inspire, the real inspiration is what our users do with what is inside. This entry was posted in Library and Archives and tagged Aleph, Alma, berlin, buildings, Erasmus, Freie Universitat, Primo, UCL Europe. Bookmark the permalink.